Get that Salt and Pepper Calamari Taste with Fish! On a dinner plate beat egg white and milk together. In a medium size mixing bowl place all other ingredients except fish and cooking spray. Mix together well (you may find using your fingers will help). Place crumbs onto another dinner plate then dip fish in egg mix and then coat with breadcrumbs. Coat a large non-stick pan generously with cooking spray. Before placing fish into pan generously spray top of each piece of fish with cooking spray. Place sprayed side down into heated pan. Cook 3 minutes. Spray top of fish with cooking spray then turn fish carefully to avoid breaking and cook for 3 minutes. To know when fish is cooked through, check if the inside of the fish is white. If you see pink, this means the fish is not cooked through yet. I know how popular salt and pepper calamari is so I thought I could imitate that slightly with this fish recipe. I couldn’t use salt as it would make the sodium count too high and who needs it anyway as the flavours come from the pepper. My low-fat chips in book 1 complement this recipe beautifully. Once more Annette has developed a great tasting low-fat alternative to a traditionally high-fat meal. 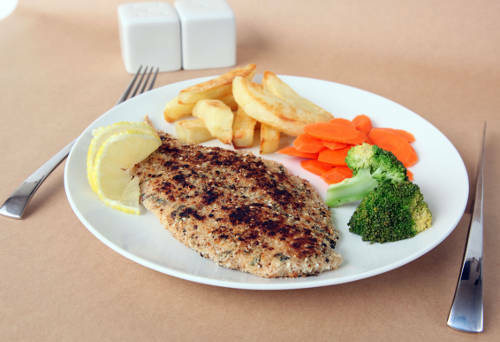 Crumbed fish is always a favourite with the whole family and this one is healthy! Annette’s cookbooks SYMPLY TOO GOOD TO BE TRUE 1-6 are sold in all good newsagencies. Visit Annette’s website www.symplytoogood.com.au for more tips and recipes and to check out her new SYMPLY SLIM & HEALTHY MENTORING PROGRAM. You can also join Annette’s page at Symply Too Good FACEBOOK.